Your horse will select his preferred essential oil by leaning forward toward the open bottle; he will show his lack of interest by simply turning his head away. Aromatherapy is the use of essential oils, pure plant extracts usually obtained by distillation, to assist your horse in maintaining a balanced physical body and emotional state of being. Horses are creatures of habit and enjoy a regular routine; when something comes along to disrupt this routine such as a move to a new farm, you can use the aromas from essential oils to assist make the transition gentle and welcoming for your horse. Before introducing your horse to a new place, it is important to prepare it for him. I find horses are very sensitive to their environment so to make the environment welcoming you need to energetically cleanse his new home. If it is a stabling complex, often the previous occupants may have dumped their frustrations or other negative emotions when working with their own horses. This is simple to cleanse and the essential oil that helps clear away other peoples’ dropped negativity is eucalyptus. If you are able to do so without feeling uncomfortable, you can wash the walls of the stable down with water that contains a couple of drops of eucalyptus essential oil. If you are not sure of what the owners of the property may think of you if you do this, simply take a spray bottle with either a eucalyptus hydrosol or with water containing the eucalyptus essential oil and a dispersant, and spray the stable your horse will occupy with your intention to clear away any “junk” from any previous occupants. When it comes to helping your horse with this adjustment, one of the most nurturing essential oils is sweet orange, from the peel of the fruit. If you picture the shape of an orange, it is inviting and bright and sunny, and what the scent does is create a space that feels like a warm motherly hug. It is a reassuring scent especially if offered to your horse when he needs a little extra special attention. Juniper is useful for the horse that worries and finds change difficult to accept. It also assists the horse who is joining a new herd to a move into his rank in the pecking order. It is also for the horse who is always looking to his owner with the look of “Am I getting it right here?” or the horse with a crinkled look above the eye. Frankincense will dispel any fear your horse may experience when you bring him to a new home. It can be useful if your horse, once moved, begins to shy at shadows when riding. It can also be used for clearing off past problems if you have had to move your horse from a “not so friendly” property. You can do a daily wipe of your horse for the first week. You simply place a couple of drops of frankincense on your hands and warm them together, then deliberately and slowly work over your horse from head to toe, sweeping away any bad feelings that may have been directed at him or you from the past. For a young gelding who may need assurance, especially if he has been gelded recently before the move, ylang ylang will bring that assurance. For the young filly, clary sage can bring the same assurance. Lavender is the essential oil to help the horse who is brought into a stabling complex, when he has previously been a pastured or paddocked horse, adjust to a more frantic and active environment where there are people and horses about all the time. For the horse who has been stabled most of the time going to pasture, patchouli will help this horse not feel overwhelmed by the space. 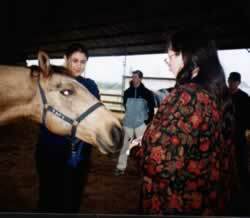 It takes some intuition on your part to assist your new horse or a horse you are moving with. You can also offer a horse in this situation essential oils including mandarin if there is an element of frustration, sweet fennel if the move has been traumatic, geranium if anger has an expression, possibly Roman chamomile if you are moving a young horse and he is showing behaviour you would describe as a childish tantrum. If your horse likes more than one of the suggested essential oils, you can blend them together for him into a carrier. As you are looking at this being his “comfort” scent for the day, add a 2.5 percent dilution to some aloe vera gel and apply where your horse is showing a physical stress. Sometimes when a horse is uncertain if his environment is secure, you will find his back will tighten. In this type of horse simply wipe your aloe vera containing the blend of essential oils along his back. If your horse creases the top of his eye and looks heavy in the head while trying to mentally process the move, this application may be most appropriately applied to his poll. For the horse who has moved and left behind paddock mates he has been attached to, rose essential oil in jojoba oil applied to his chest will help with the grieving process and strengthen his sense of self while adjusting to his new home. The key to selecting the best essential oils for your horse is to have a small selection and offer them to him on a daily basis. Each day during this transition period, his attraction to the essential oils will vary. For this reason it is best to make up any blends as each day dictates. Your horse will select his preferred essential oil by leaning forward toward the open bottle; he will show his lack of interest by simply turning his head away. The benefit with using essential oils when moving is you will benefit just as much as your horse when you use the essential oils to help him. Inhaling essential oils will work with both your limbic systems within the brain so that this move will become a pleasant memory, so that in the future if another move has to be faced, you will be able to recall the “good” memories to assist you again. This article is for informational purposes only and is not intended to replace professional veterinary care.